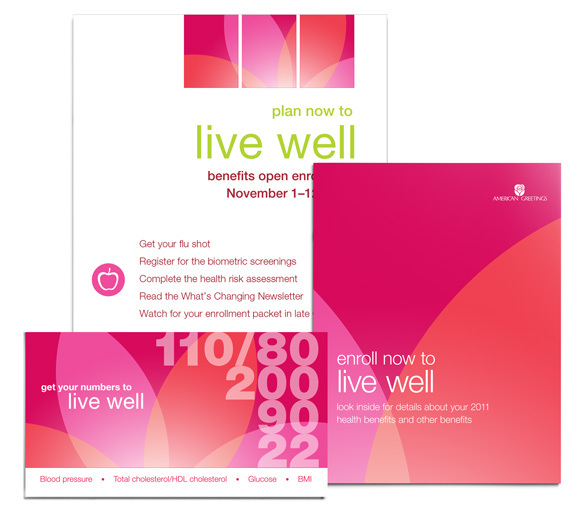 American Greetings’ bold campaign—and savvy plan redesign—boosts CDHP enrollment and sets the foundation for big engagement in wellness. American Greetings Corporation is a leading manufacturer of greetings cards, party goods and a variety of other expression products. Headquartered in Cleveland, Ohio, American Greetings generates annual revenue of approximately $1.7 billion, and its products can be found in retail outlets domestically and worldwide. American Greetings employs more than 20,000 associates in locations across the country. The greeting company famous for evoking emotions and actions with just the right words and images needed a dose of its own medicine to help associates and their families understand and use benefits programs. Big changes to benefits were coming, and benefits materials needed a “wow” factor so that associates and their families would sit up and take notice. They wanted to double enrollment in consumer-driven plans in a single enrollment cycle. 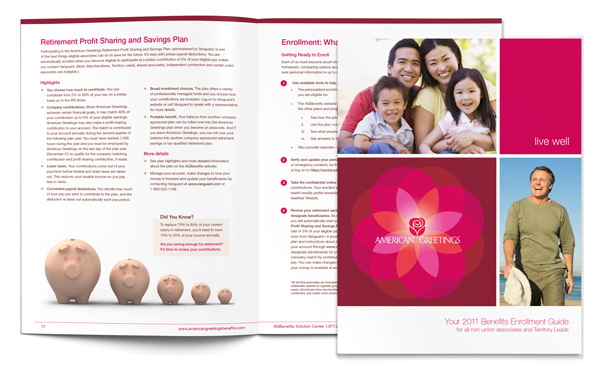 Doubling enrollment in a single period was a major task made more difficult by the fact that American Greetings had no communication strategy or plan in place to help it reach its goal. They were scared of the high deductible. They didn’t understand how the plan worked when using services. They didn’t understand how the plan coordinated with the HSA to help offset the deductible and pay for eligible expenses. We created a communication plan to educate families and re-engage them in their benefits so that they would choose the right medical coverage to help them save money. The communication plan also had to address the increasing costs associated with the changes in medical plans as part of health care reform without compromising the value of health care benefits. As if that wasn’t enough, audience needs were vastly different. American Greetings has four unions and a large non-union population. Ages range from mid-twenties to early sixties. Personal situations are very diverse. Associates are spread out across the country—from the Midwest headquarters to manufacturing plants in the South to a field sales and service staff never in one place for very long. Many associates had limited access to computers, email and the Internet during the workday to receive messages. Just as no single card in the world can truly explain love, a one-size-fits-all approach to benefits communication at American Greetings wouldn’t get the job done. Diving deep into demographics and plan usage data, we built a multi-year, integrated communication strategy to educate families about their benefits. 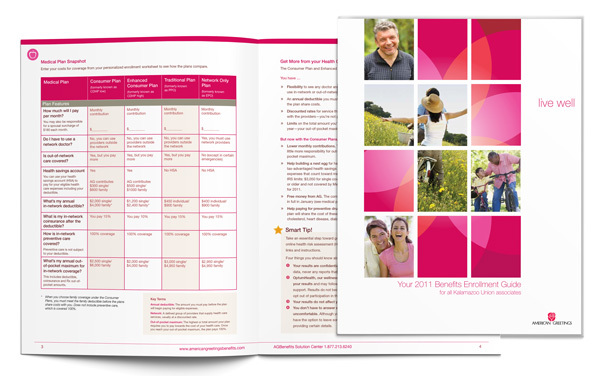 We crafted targeted, easy-to-understand content, that included the creation of detailed audience profiles, to help associates choose a medical plan that would best fit their circumstances and budgets. It also helped them and their families take steps to improve their health and use benefits wisely year-round. An amazing visual campaign brought the content to life and set the standard for applying the new American Greetings brand internally. For just one enrollment season, we created more than 50 pieces of communications. Several pieces had multiple versions to accommodate a non-union group, four associate unions and retirees. Send anyone a thoughtful card, and they will respond. The same happened at American Greetings. More than 1,700 associates enrolled in one of the consumer-driven plan options with a health savings account—more than doubling total enrollment from 20% to 47%. And nearly all new CDHP enrollees opened health savings accounts—a critical step to receive the company’s annual contribution of up to $1,000. Participation in the health risk assessment and biometric screenings by associates and their spouses were up more than 25% each from the previous year. American Greetings also received positive feedback from associates on communication materials. They looked great, had the right amount of content and tone, and were delivered through the right channels. Best of all, American Greetings had the communications strategy, plan and infrastructure to launch new wellness programs and continue the dialogue with associates year-round. It turned out that the ingredients that make a great card also make for great benefits communication: Attention to detail, creative art, and words that speak to a healthy heart, healthy mind and a healthy family.